EOS available on CoinDeal! But check the surprise! This is the cryptocurrency that won in our 6th voting in “vote for a new cryptocurrency” system along with TRON and SLT. EOS is a cryptocurrency initially based on Ethereum (now, developers have created own blockchain) using blockchain technology with the decentralized operating system. In the end, it will be exactly 2,000,000,000 coins. The main thing that makes this cryptocurrency stand out against others, is that there is no fee the user is paying after a conduction of a transaction. Instead, the user buying a coin is becoming an owner of a small part of the network. EOS is also resistant to DDoS attacks. EOS is paired with Bitcoin (BTC). 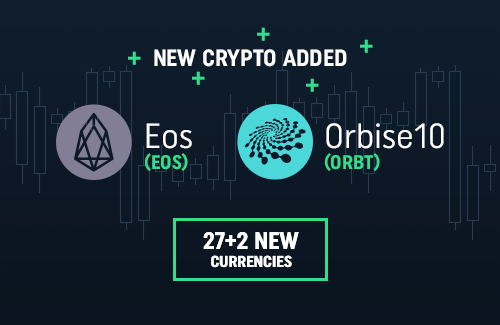 We can also present a new markets: EOS/BTC and… ORBT/BTC. As a bonus we have decided to add a new cryptocurrency to CoinDeal - ORBISE10. ORBISE10 is an ERC_20 token which represents a predefined basket of well-known and highly liquid cryptocurrencies. Don’t forget about voting for your favorite cryptocurrencies which should be - in your opinion - added to CoinDeal - a cryptocurrency exchange platform. Follow us on Facebook to be up-to-date with the latest news.